Thank you Dallas Junior Forum for your generous donation! Dallas Junior Forum has presented a generous check to Frisco Family Services to assist in purchasing fresh food for our 2016 Thanksgiving Meal Program. Every November, Frisco Family Services provides about 250 families with a turkey and everything needed to prepare their Thanksgiving meal. Funds from Dallas Junior Forum help us purchase the perishable foods families need right before the holiday. 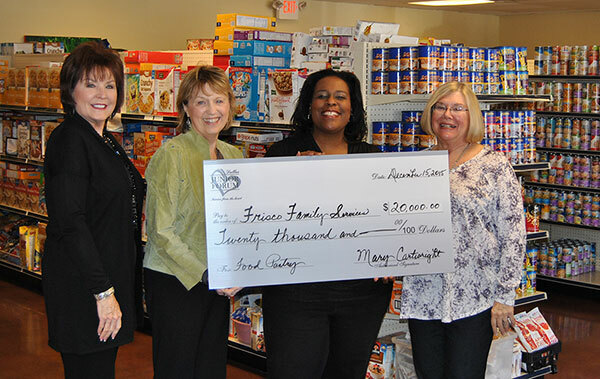 "Members of Dallas Junior Forum volunteer hundreds of hours at Frisco Family Services, working inside the Food Pantry and Frisco Resale store to stock donated food and clothing and help clients", said DJF’s Service Chair for Frisco Family Services Vicki Stangle. “Our members also flock to help out at FFS’ annual Back to School Fair and Summer Lunch Program,” she said. On behalf of Frisco Family Services and all of our clients, thank you to Dallas Junior Forum for their CARING support, generous donations, and volunteerism. COMMUNITY BEGINS WITH CARING.